Dr. Lucy Ozarin, NLM Volunteer Extraordinaire! 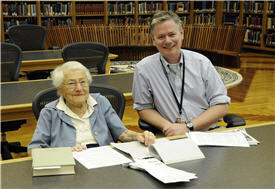 Lucy Ozarin, MD, MPH, has spent much of her life devoted to books, science, and helping others, so it was no surprise when one day in 2004 she asked to volunteer at the National Library of Medicine in the History of Medicine Division (HMD). At the time, she was only 90. Still spry and now 98, Ozarin arrives promptly at 8 o’clock most Monday and Tuesday mornings for three-to-four hours of volunteering at the Library, after a short walk from her home nearby. She appears in what she calls her “library costume,” a blue jacket with ample pockets in which she carries her library card. “I have lived my life among books,” she explains of her work sorting through and enhancing public access to some of the treasures in the NLM collection. Michael North, head of Rare Books and Early Manuscripts in HMD, works with Ozarin and is fond of crediting her with important discoveries and projects that garnered her a 2008 NLM Director’s Honor Award. Born in New York in 1914, Ozarin graduated from New York University and earned her MD from New York Medical College in 1937. She began a lifetime interest in psychiatry and neurology during her residency at Grasslands Hospital in Valhalla, New York, (1939-1940), and at Gowanda State Hospital in Helmuth, New York (1940-1943). Certified by the American Board of Psychiatry and Neurology in Psychiatry (1945), Ozarin later earned an MPH from Harvard University School of Public Health (1961). She has the distinction of being the first female psychiatrist in the United States Navy, serving from 1943 to 1946. After the Navy, she served as Assistant Chief and Chief, Psychiatry & Neurology Division, for the Veterans Administration, from 1946-1956. 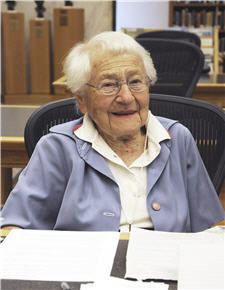 In 1957, she joined the National Institute of Mental Health (NIMH) at the National Institutes of Health and spent some of her service as a consultant and advisor to the World Health Organization regional office in Copenhagen until retiring in 1981. Through work and personal travel she’s been to six continents and to mental hospitals in every US state and all the territories except Samoa. Ozarin has devoted much of her life in retirement to volunteering. “I’ve been happy,” she says. “Volunteering helps lend structure to my life. Until this past February, I volunteered for 22 years at the Suburban Hospital kitchen, making salads, dishing out desserts and preparing lunches for the emergency room.” Ozarin says the hospital in Bethesda, Maryland. honored her for her service at this year’s annual awards luncheon. As an NLM volunteer, one of her notable contributions has been to select the images and write much of the text for the HMD Web site Diseases of the Mind: Highlights of American Psychiatry to 1900. For this, she drew on her years as a volunteer for the American Psychiatric Association, writing history notes for Psychiatric News, and from her own long experience as a psychiatrist. According to North, her Diseases of the Mind text traces the beginnings of some of the earliest asylums for the mentally ill in colonial America and their evolution into large state hospitals. It also discusses humane treatment of patients, the dilemma of the chronically ill and forcible commitment. To augment the text, Ozarin delved into the Library’s collections to identify many striking images, including portraits of prominent early psychiatrists and images of 19th-century hospitals. North describes Ozarin as “undaunted” by his request to sort through HMD’s collection of over 20,000 reprints and select items of particular monetary and scholarly value for cataloging in NLM’s LocatorPlus. Using Garrison and Morton’s A Medical Bibliography, an annotated reference of important texts illustrating the history of medicine, Ozarin culled highpoints in medical publishing from the largely uncataloged collection. Thanks to her “deep and extensive knowledge of the history of medicine,” North says, Ozarin found many important historically significant items including texts by luminaries such as Sir William Osler and William Welch, as well as numerous items published from 1880 to 1920, and several texts from before 1801. The great number of items was a challenge. Ozarin arranged everything in alphabetical order, cleared lots of empty shelf space, and placed each item in separate envelopes. While sorting through about 500 18th century medical dissertations that hadn’t been examined in more than 30 years and were thought to be duplicates of originals already cataloged, Ozarin made yet another discovery: two inscribed copies of Benjamin Rush’s 1768 printed dissertation, written while he was a student at Edinburgh. Rush was the nation’s first Army Surgeon General and a signer of the Declaration of Independence. Ozarin says “being physically active is important to a long life.” She played tennis and golf when she was younger. Now, she does stretching exercises and walks every day, often a mile to the grocery store. If the weather is bad she walks in the long hallway of her building. And what does she still want to do? August 24, 2012 in Featured Articles, People.